So at this point, we all know what a Christmas fanatic I am. And I guess when New Year's rolls around, I'm able to get a small idea of what bewilderment others may feel toward my obsession with the yuletide. I am not into New Year's. I never have been. It doesn't make much difference to me to make a big deal out of a new year starting. The past two I have spent working. Every other before that has been marked by minimal partying, especially since the only real "parties" I can remember attending for the Eve were prior to my 21st birthday. I volunteered to work these past two since I get time and a half and it matters so little to me and so much to others. When I was working last year and explaining how it actually wasn't my holiday, I said to my co-worker that I didn't understand why people cared. Apparently this person did, and she told me all about how people see it as a chance at a new beginning, a time to start over. I guess I see that. 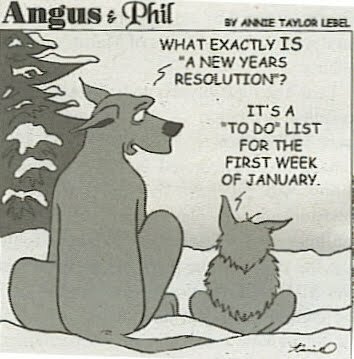 But...it's kinda how I feel about New Year's resolutions. 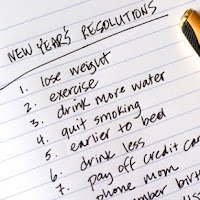 Why are we waiting for a new year to start good habits and end bad? My sister-in-law seemed to have the same sentiment the other day as she wrote about what she wanted to do in 2011. We don't do New Year's resolutions. If something is important enough for me to start or stop doing, why wait months to do it? Every day (or night in my case!) we get a chance to start over. New Year's is simply one of those, just like the other 364. But...(again), that's just me. If marking the new year is what helps you cope in the changes you need to make and gives you hope for a new life, nation, world--then by all means, celebrate. We all have our ways of dealing and events that keep us renewed. It's not like I do the best job of implementing change on a daily basis anyway. I'm probably not one to talk. I feel this way about new year's as a holiday, too. i used to work that holiday, no problem, too. it was always interesting to listen to the police scanner on that night! i bet it's even more interesting working in a hospital on new year's eve, though. in fact, i sometimes start my entire day over before the sun goes down. it's never too late to start over. you don't need to wait for a time or a sign. just take a deep breath and start over! it reminds me a line from City Slickers: You're life is a do over. Haha, "read a book a month." For some reason that really made me laugh. 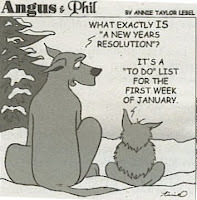 I'm not typically a 'new years resolutions' person, either. I tend to make changes when life seasons change. Or when something just isn't working and needs to be revamped. It's certainly not necessary to wait until January. Yep, right there with you! I think for most it's the idea of a "fresh start" -- blank calendar if you will. But I'm with you, if the habit needs to be started, why wait for a date on the calendar? I used to work Christmas Eve when I was single because there were so many moms and dads who I worked with and I thought it was unfair for them to have to be away from their kids that day/night.